Located in the northern part of the U.S. state of Utah the Great Salt Lake is the largest salt lake in the western hemisphere and the 37th largest lake on Earth. The lake covers an area of around 1,700 square miles (4,400 km2) but fluctuates due to its shallowness and time of year. The Jordan, Weber and Bear rivers, the lake’s three main tributaries, deposit around 1.1 million tons of minerals in the lake every year. The Great Salt Lake is the largest remnant of Lake Bonneville that covered much of western Utah and areas of Nevada and Idaho during prehistoric times. At its peak Lake Bonneville’s surface area was nearly as large as Lake Michigan, 22,400 square miles and considerably deeper. According to historian Wilford Woodruff’s Journal, the leaders of the pioneer settlers journeyed to the south shores of the inland lake on July 27th 1847. They bathed in the lake and were thrilled to find that they did not sink, “No person could sink in it, but would roll and float on the surface like a dry log. We concluded that the Salt Lake was one of the wonders of the world.” They decided then to name their city “City of the Great Salt Lake.” This was later changed to Salt Lake City. A few years after the pioneers settled in the area the Colifax Party, a group of men touring the continent, visited the Great Salt Lake to bathe and picnic on the beach. Mr. Bowles, a member of the party, in his book Across the Continent gives a flowing description of the wonders of bathing in the lake and the beauty of its surroundings. 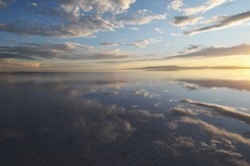 The Great Salt Lake provides habitat for millions of native birds, waterfowl and brine shrimp. The lake is home to a large population of Wilson’s Phalarope, a small, salt-loving, wading bird. There are no fish in the Great Salt Lake due to the high salinity. The lake has 11 islands, though this number varies depending on the level of the lake. From largest to smallest these islands are: Antelope, Stansbury, Fremont, Carrington, Dolphin, Club, Badger, Strongs Knob, Gunnison, Goose, Browns, Hat (Bird), Egg Island, Black Rock and White Rock. There are also a small number of unnamed islands. The Great Salt Lake is one of Utah’s largest tourist attractions and attracts hundreds of thousands of visitors every year.